Snowed in? No better time to read the holiday edition of EcoAlert Winter 2016! This special holiday edition of EcoAlert sets the stage for NB’s climate future with an update on the Select Committee on Climate Change report, dives headfirst into NB’s new Local Food and Beverages Strategy, and takes you on a tour through the province’s burgeoning craft beer and cottage wine scene. Click here to download a PDF version of this issue, or head to our archives for past editions. You can flip through the pages of EcoAlert online in a few different ways: hover your cursor over the bottom corner of the page; click on the shaded bar running up along the right-hand-side of the magazine; or use your mousewheel. To enter full screen mode, click on the furthest button to the right on the gray menu bar at the top of the magazine (looks like a little computer monitor). This menu also includes buttons for searching the document, sharing it with friends, or accessing more options. Click on the page to zoom in. Use the cursor or directional keys on your keyboard to move around the page. If the cursor moves too loose, you can get more control by clicking the button called ‘Move by mouse position.’ To access this feature: enter full screen mode, double-click on the page, a new menu bar will appear near the bottom of the page. The ‘Move by mouse position’ is the last button on the far right (looks like a hand with brackets around it). This will let you move the cursor freely without moving the page. If you want to move around the page in this mode, just click and drag your cursor. Have a story idea for our next edition? Are you interested in advertising in EcoAlert? We’d love to hear from you. Contact Corey Robichaud at corey.robichaud@conservationcouncil.ca or 506-458-8747. 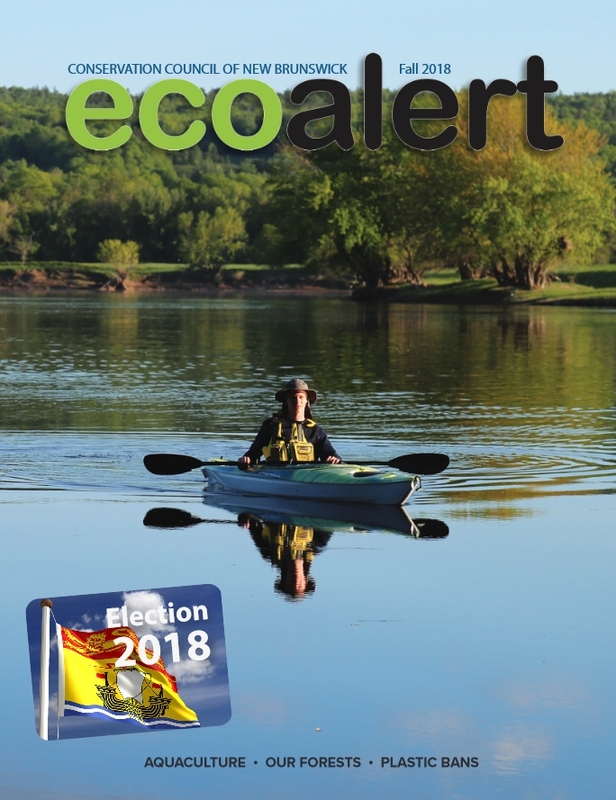 EcoAlert is the Conservation Council of New Brunswick’s membership magazine. It brings you environmental news, exciting stories of positive change happening in our communities, and important action alerts from across our province. We share stories of the work we’re doing in our program areas – including Forest Conservation, Freshwater Protection, Climate & Energy, and Marine Conservation – as well as updates on our Community Projects such as Buy Local NB and Learning Outside. See below for more on how to use our EcoAlert online edition.